Four dozen more you say? I can do that. 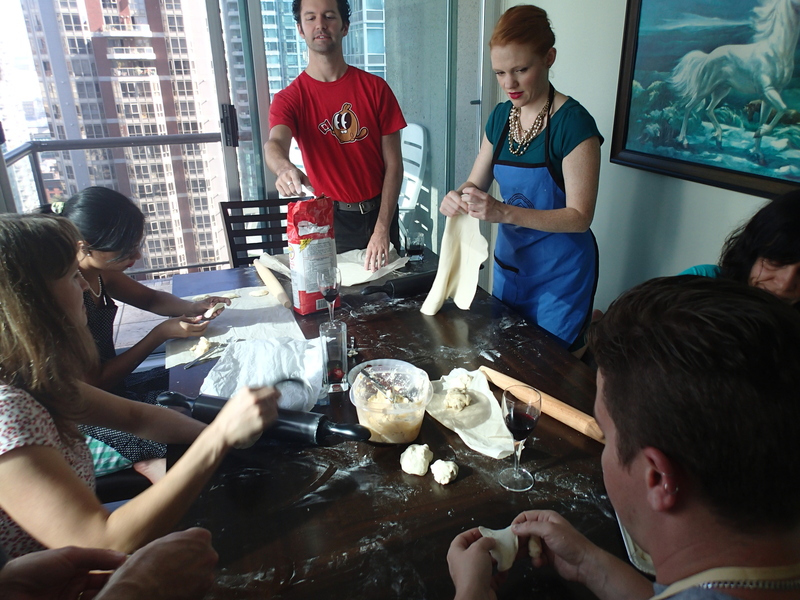 On the weekend I had a few people over to learn the art of the perogie. 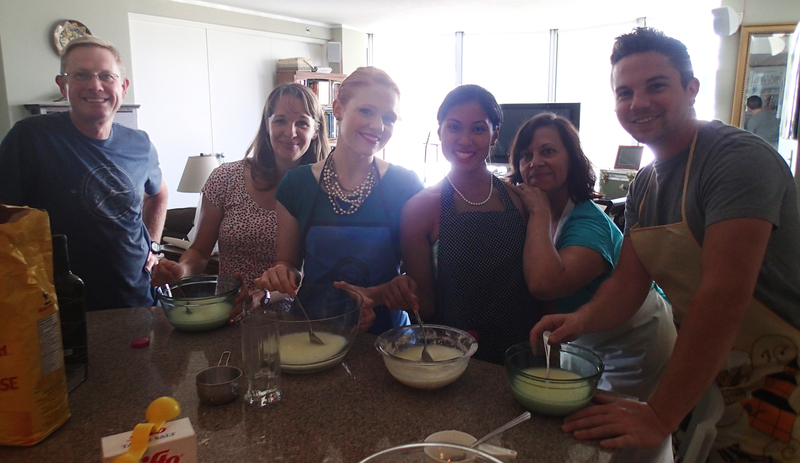 We made about 36 dozen (give or take a dozen…you know, no big deal). This post is fulfilling my promise to make the recipe we used available to all of my lovely guests. 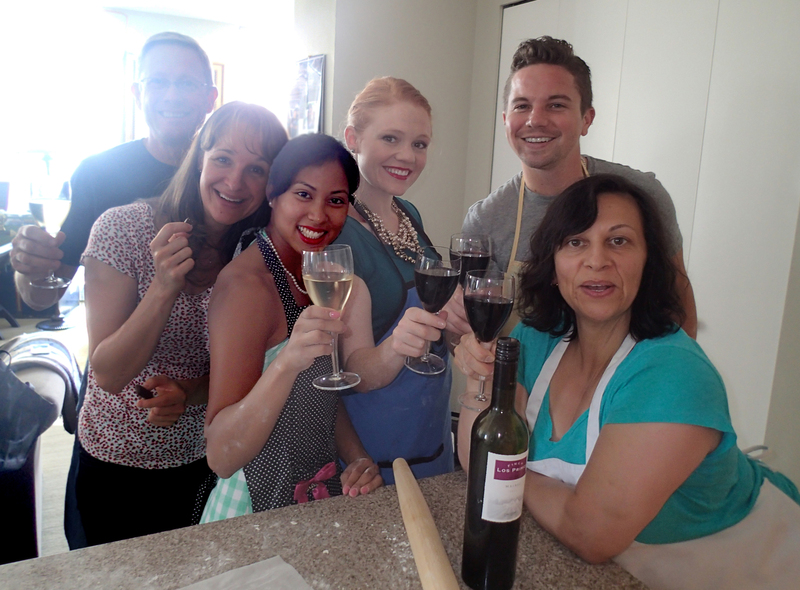 Thanks for a fun day lovely guests. 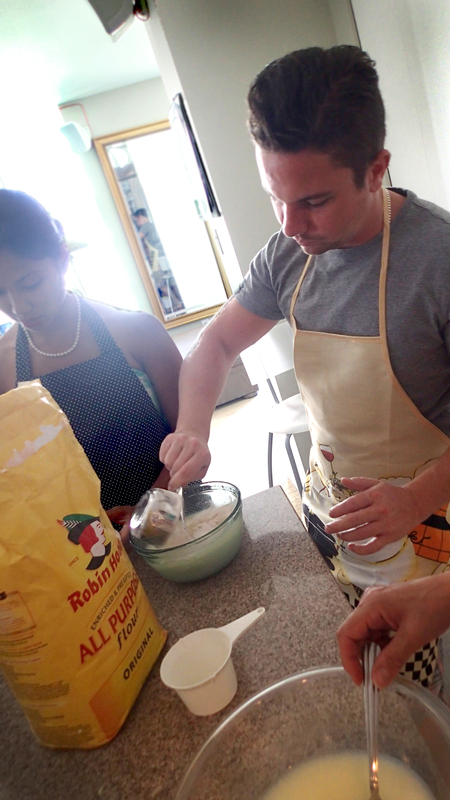 We began by mixing the wet ingredients and salt. Mel and Royce mixing the wet ingredients (and salt). Smile! Royce you’re such a good model. Then we added 9-10.5 cups of flower (one cup at a time). The amount of flower depends on the humidity, elevation and other things I don’t understand. (I think the number of gnomes that live in your garden are involved in the equation.) Just keep adding flower until it feels right. Did you ever have your grandmother say “I don’t know how much flower (or whatever) I use to make the recipe dear” and think they were just trying to make it look hard, or easy, or whatever made you feel worst? Same kind of thing. Except I’m not trying to emotionally manipulate you (this time) it’s just how you make perogies. 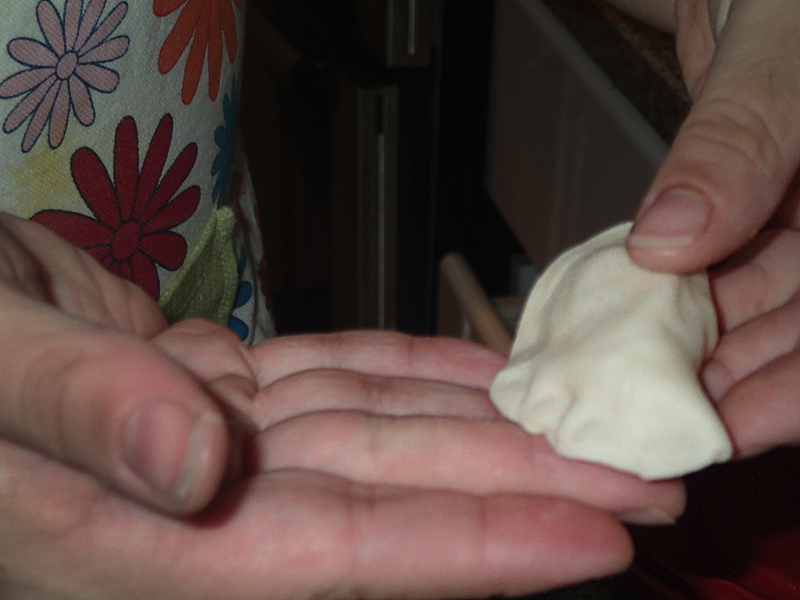 The perogie “feel” is why it’s best to have someone show you how to make dough the first time so you can feel a sample then try to replicate that feel. 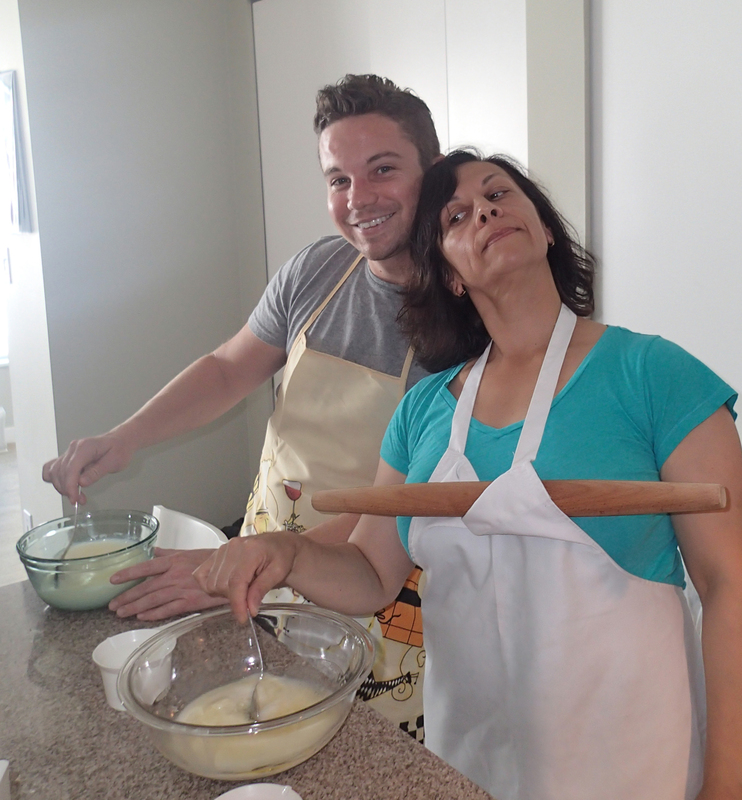 When the dough gets too stiff to stir with the spoon it’s time to get your hands dirty. (Clean them first though. Pre-dirty hands are gross. Do I need to say that? Well I did. Ew.) This part takes a while. 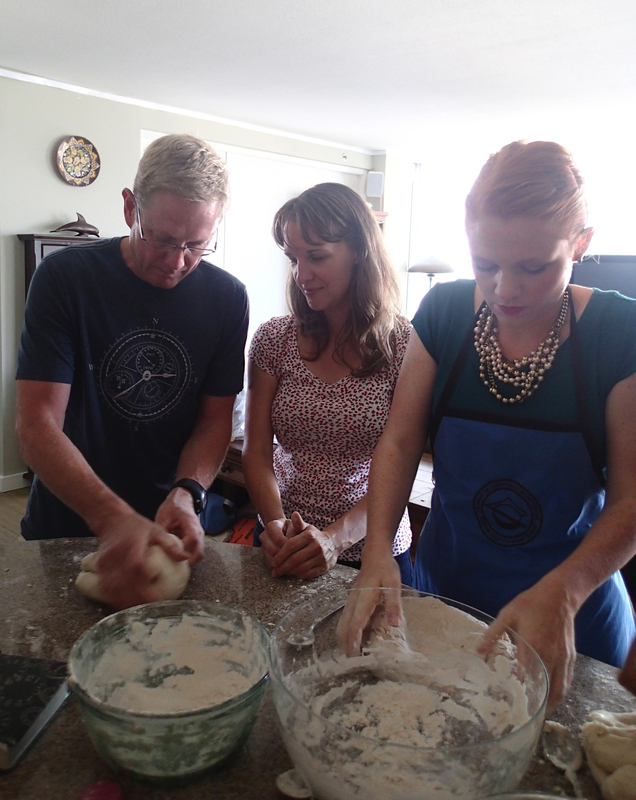 Keep kneading the dough to activate the gluten and work all the flower in. It should be tacky, but not sticky when you’re done. Great work guys! Keep going. Put the dough in a covered bowl and set it aside. 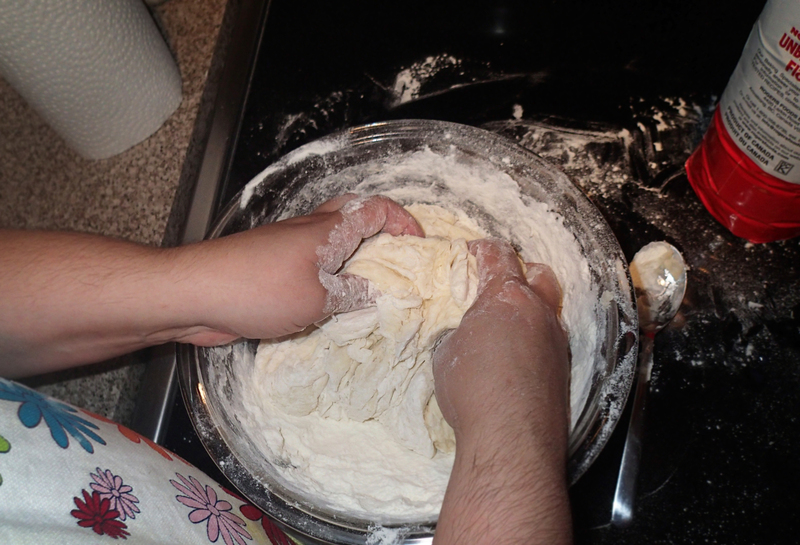 (To prevent the dough from drying use a damp cloth to cover the bowl or wrap it in plastic and put it in the fridge.) Dough can last in the fridge for up to three days but should really be used within 24 hours. Or, you can put it in sealed plastic bag (no air) and freeze the dough for later use. 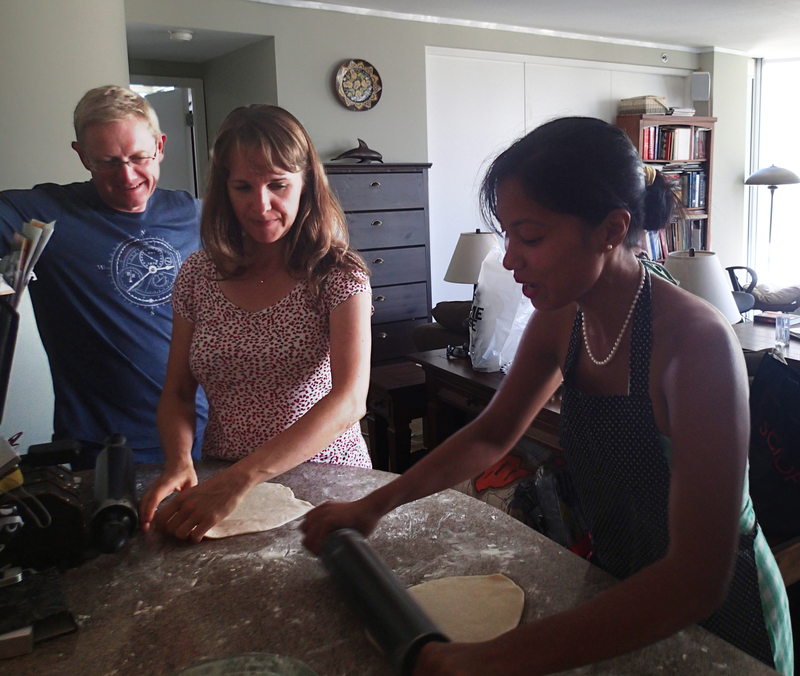 When the dough has rested it’s time to roll. Take a small piece of the dough and roll it flat, adding flower and flipping regularly to prevent the dough from sticking to the counter. The dough should be thin but not transparent. When you have a nice flat piece of dough, use a circular cookie cutter (or old can of Campbell’s soup concentrate, they are the perfect size) to cut circles from the dough. 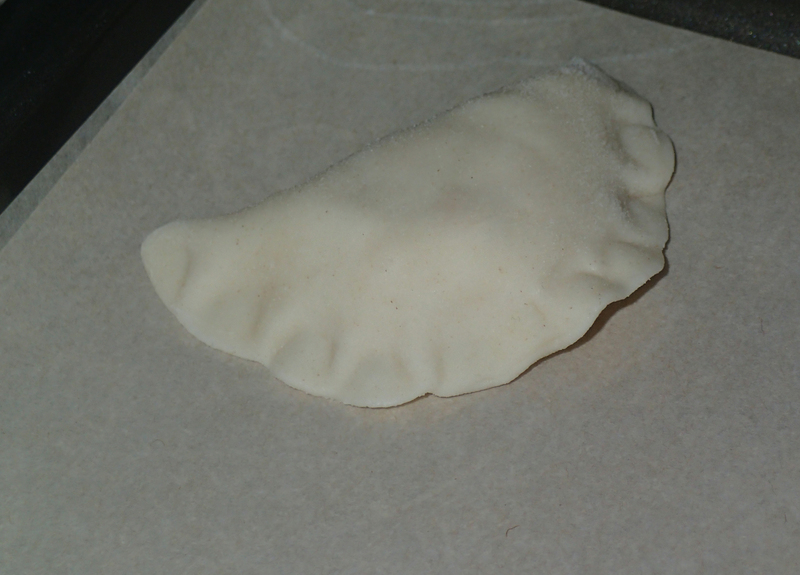 Place a small amount of filling into the centre of the perogie. Don’t over fill. 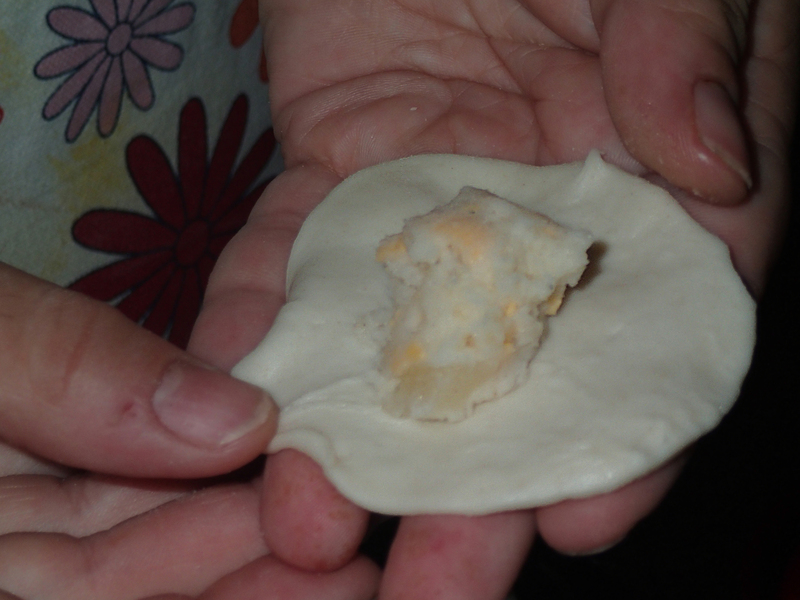 If filing gets in the area to be sealed, the perogie will break apart in the water and give you perogie soup. 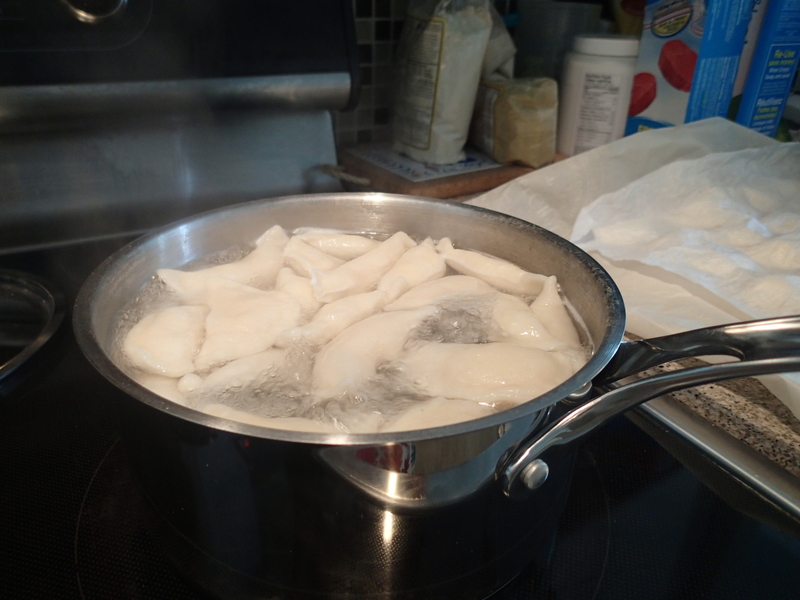 Lay the perogies on a clean cloth or parchment paper on a cookie tray or other flat surface that will fit in your freezer. (Fresh perogies stick together easily so do not allow the perogies to tough each other.) 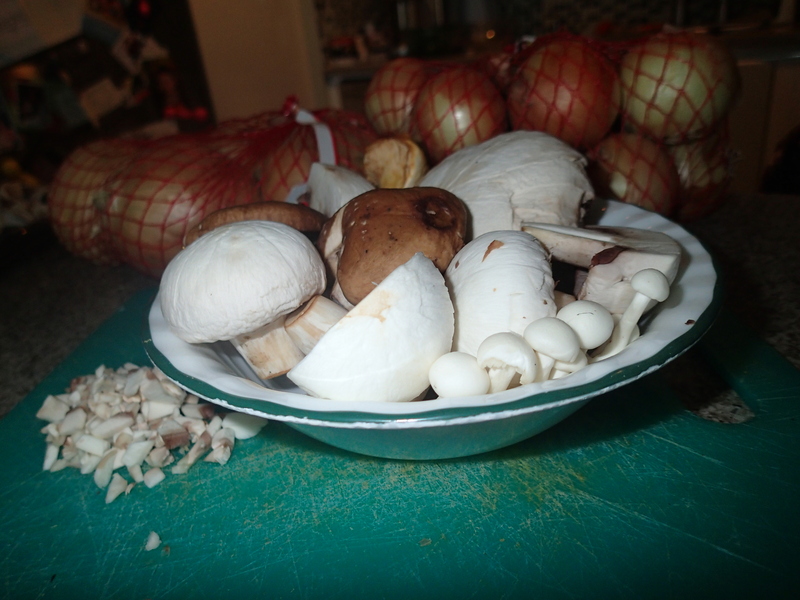 Cover with a slightly damp cloth and repeat until you have a full tray then pop them in the freezer. Ready for the freezer. Or the pot! Be sure to make extra. Day old perogies are best fried with onions. Mmmmm. 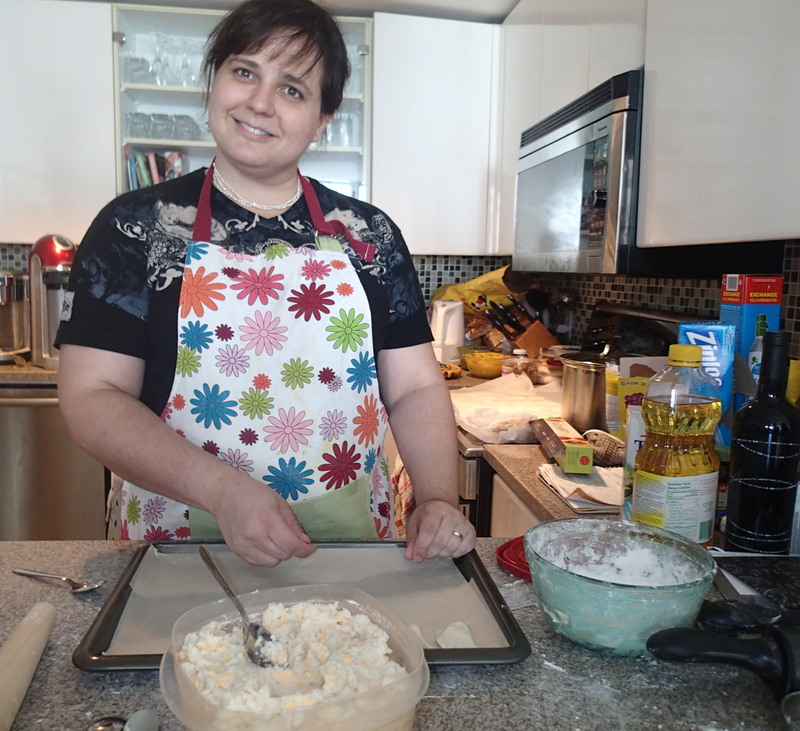 Potato and cheese perogies are generally made with mashed potatoes. I use grated cheddar cheese, sour cream, onions fried in butter, garlic power, salt and pepper to taste. It works best if you make the mixture in advance and chill it before use. 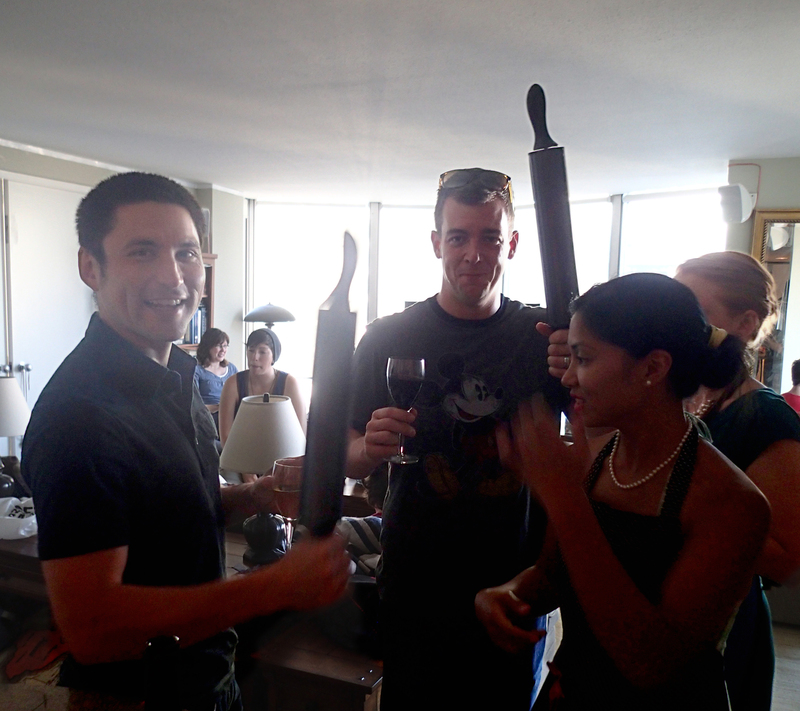 Men with tools of baking… and destruction.